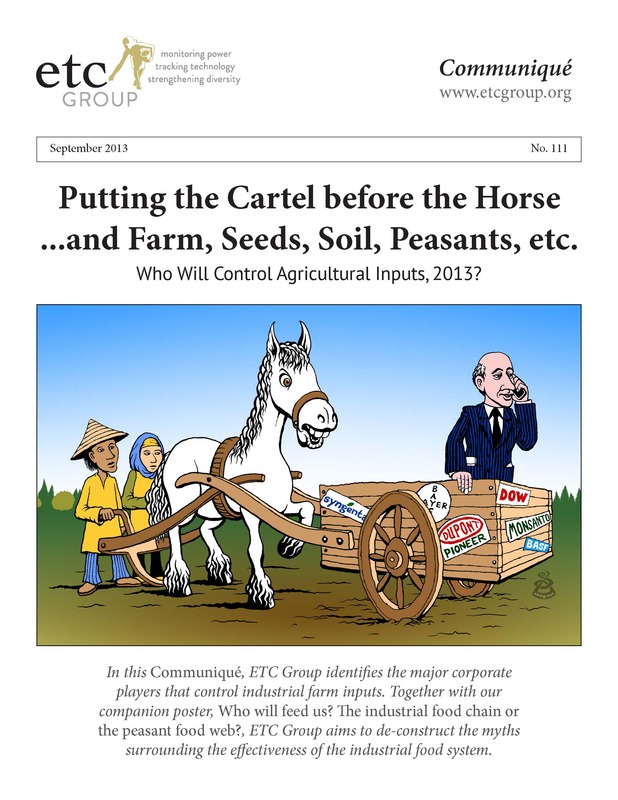 Putting the Cartel before the Horse...and Farm, Seeds, Soil and Peasants etc: Who Will Control the Agricultural Inputs? ETC Group has been monitoring the power and global reach of agro-industrial corporations for several decades – including the increasingly consolidated control of agricultural inputs for the industrial food chain: proprietary seeds and livestock genetics, chemical pesticides and fertilizers and animal pharmaceuticals. Collectively, these inputs are the chemical and biological engines that drive industrial agriculture. In this Communiqué, ETC Group identifies the major corporate players that control industrial farm inputs. Together with our companion poster, Who will feed us? The industrial food chain or the peasant food web?, ETC Group aims to de-construct the myths surrounding the effectiveness of the industrial food system. In addition to data on private sector plant breeding and the commercial seed and agrochemical industries, the report includes market data for the fertilizer and animal pharmaceutical industries, as well as the highly concentrated livestock genetics industry and the fast-growing aquaculture industry. Download the pdf to read the 40-page report. The same six multinationals control 75% of all private sector plant breeding research; 60% of the commercial seed market and 76% of global agrochemical sales.